On Thursday, U.S. Secretary of State John Kerry will meet with his Russian counterpart, Sergey Lavrov, as the Obama administration considers a proposal by Russian President Vladimir Putin for the eventual disarmament of Syria. Two Pew Research Center polls conducted in 2012 suggest the American public is skeptical about the nation at the center of the latest developments in the Syria situation. In a May 2012 survey, 60% of Americans said the U.S. could not trust Russia too much or at all, while just 33% said Russia could be trusted a great deal or a fair amount. Of the nine countries tested, only China, Saudi Arabia and Pakistan were seen as less trustworthy than Russia. 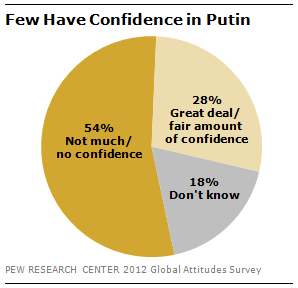 Similarly, the Spring 2012 Global Attitudes Survey found that more than half of Americans (54%) lacked confidence in Putin to do the right thing in world affairs; 28% expressed confidence in the Russian president, while 18% did not offer an opinion. Skepticism toward Russia and its president were evident across party lines. For example, 68% of Republicans, 58% of Democrats and 57% of independents said Russia was untrustworthy. Majorities of Republicans (61%) and independents (58%) also said they did not have confidence in Putin when it came to world affairs. Among Democrats, fewer than half said they lacked confidence in the Russian president, but the balance of opinion was negative; 35% said they had confidence in Putin and 47% said they did not. 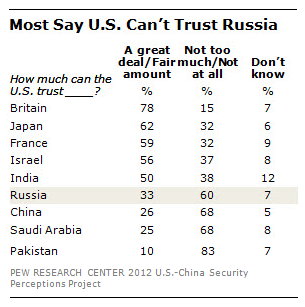 Correction: In the original chart “Most Say U.S. can’t trust Russia,” the results for Pakistan were incorrect. They were corrected on Sept. 13, 2013.